thirsty from walking around the shelves, the racks, your eyes are even going to be dried out from all the colours, fabrics, shoes and so many others things. You will crave a drink, but there will be no vending machine in sight. 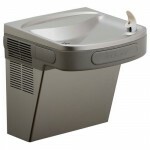 And all of a sudden, you will spot it – the water fountain! What a relief – you will go there press the button and have some chilled delicious water! What is the first thing on your mind now? It probably is – this department store really cares for its customers! Yes, you can spend there all day, without spending money for drinks. The water fountains are also a bliss for all of those who shop with their children. This is something that comes as so much help for those who bring their children along shopping, that often times they make it as the place where kids will go in case they lose their parents in the store. Just imagine – small children get thirsty, they run around, they get messy, they drop their bottles, they drop theirs pacifiers and what is the parent to do? Just go to the fountain – have everything washed, fill up the water bottle and keep on shopping. Wash their hands even. Sometimes people do not appreciate things they have, but when the time comes, you will be grateful for those great drinking fountains in your department store.